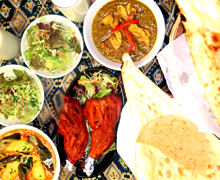 If you are in the mood for naan with your curry, SHIVA is a place to go. A variety of curries, including chicken, vegetables, seafood, keema, and pork, will satisfy your appetite with your choices of spiciness up to 50 times. Choices for naan are: plain, cheese, garlic, and honey. There are two SHIVAs in Kumamoto City: one in Kengun and the other in Yahata.